This restaurant operated by Mimmo Inc. dba Mimmo Ferraro's Restaurant has filed Chapter 7 Bankruptcy and will be closed indefinitely. 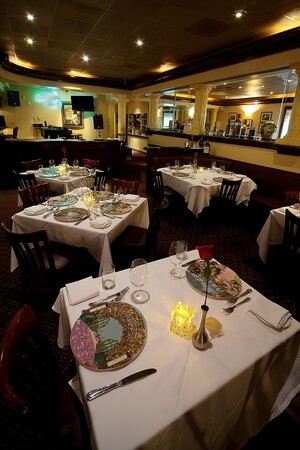 Just beyond the blinding glitz of the Las Vegas Strip lies the quiet elegance and homey charm of Ferraro's Restaurant. This family institution has been delivering refined Italian fare to locals and savvy visitors for almost 24 years. 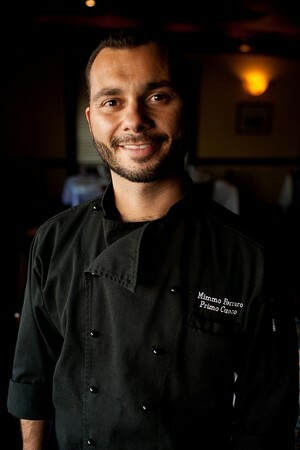 Executive Chef Mimmo Ferraro's menu pairs familiar staples with more adventurous and atypical specialties, educating diners' palates in the subtleties of Italian cuisine. Presented with charm and enthusiasm by an inviting staff, it is no wonder that Ferraro's continues to be a popular and convenient destination for those seeking the gastronomic excess of Sin City without the the sensory overload and frenetic pace. Arriving at Ferraro's, we feel like we have discovered a tranquil island amidst Las Vegas's tumultuous sea of traffic and activity. Only the restaurant's neon sign hints at its flashy location, its glow shaded by bowed palms. We enter and are immediately greeted by Gio Ferraro, the restaurant's owner who welcomes us with a warm smile and handshake. On our way to our table, we pass the bar, already bustling with happy hour revelers settling in for a more casual after-work respite. The main dining room evokes a classically romantic ambience with soft amber lighting illuminating Roman style columns and red rose table centerpieces. Ferraro's embraces an Old World class, with a chivalrous attention to detail: chairs are pulled out for us, napkins are placed on our laps, and offers of assistance with our sweaters are made with gentle concern. Seated at our pristine white clothed table, surrounded by pictures of dreamy Italian coastlines, we soak up the peaceful calm of the restaurant and await our feast. We don't wait long: our waiter, Piero, arrives shortly to present us with Ferraro's dauntingly expansive wine list, saying with a flourish “Here is our Bible and I will be your priest.” After looking through the tome of regionally specific and deliciously obscure Italian, French, German, Californian, and Australian wines, we are happy to put ourselves at the disposal of our oenological “priest,” who teams up with Chef Mimmo himself to guide us through the divine epicurean epiphanies that lay in store for us. We are immediately immersed in Italian dining tradition when we are presented with glasses of Bracceto d'Aqui, a sweet, slightly sparkling red from the Abruzio region, that, in Piero's words, is sipped in Italy to “open up the stomach” before a meal. With fruity, cassis notes, and a subtle floral, nectar taste, the wine is a distinctive beginning to the evening and a brilliant lesson for the palate in the unknowns of Italian dining culture. Our feasting commences with an exercise in contrasts: the Spaghettini Carbonara and the Lobster Risotto. On the left side of the plate, the earthy aroma of black truffles wafts up from a delectably creamy pile of risotto, studded with large pearly white nuggets of lobster meat. To the right, a tangled mass of saucy, red spaghettini conceals large, crisp bits of bacon. Each dish is a revelation in layered flavors and textures. The richness of the Lobster Risotto creeps up on the palate and builds with each bite: beginning with the creamy, milky swollen grains of risotto, the earthy, almost fermented potency of the truffles begins to permeate, punctuated by sweet, buttery lobster morsels that act as little explosions of oceanic opulence. Unlike the subtle richness of the Lobster Risotto, the Spaghettini Carbonara immediately announces itself with a smoky, spicy assertiveness. The meaty, salty flavor of bacon engulfs the palate, using the spaghettini as a starchy platform for presenting its boldness. Hints of other Carbonara ingredients are detected as we dive further and further into the depths of the dish: an eggy richness, a fresh burst of tomato acidity, the salty notes of parmesan. The Pinot Grigio selected by Piero further accentuates the distinctions of each dish, its lighter notes illuminating the subtle sweet and smoky aspects of the risotto while its traces of spicy undercurrents marry well with the bacon in the carbonara. Ferraro's Gnocchi and Calabrezi are brought out for our second courses. The gamey aromas of meat and spice immediately greet us and set high expectations. The golden potato gnocchi nuggets peek seductively out from their stewy sauce, dotted with sauteed bits of pork, veal and beef. The dumplings dissolve into pure buttery pleasure, a delightfully satisfying mouthful of starchy potato and salty parmesan that is “hugged” in a warm blanket of zesty, wintry meat sauce. The Calabrezi, a housemade Southern Italian-style sausage, rises from its bed of sauteed peppers with architectural power before a pond of red marinara sauce. The spicy heat of the sausage tingles the tongue, warming the taste buds and invigorating the palate, before the rich, deep gameyness of the meat settles in. The addition of the sauce, dominated by a clean, fruity tomato flavor, calms the heat. It is a dish that combines the intense gratification of rustic authenticity with the refinements of culinary mastery. In true Italian style, we are treated to a traditional palate cleanser: a simple Lemon Sorbet. Presented in an elegant martini glass, the dainty scoop of snow white sorbet is accented by a sprightly mint leaf garnish. Sweet lemon floods our senses upon the first bite, sweeping away all other flavors like a cleansing tidal wave. We are left with a lingering juicy sweetness and truly refreshed palates. Ferraro's Osso Buco, its highly anticipated signature dish, is presented to us with the solemn respect worthy of its fame. A large tower of bone, dripping with thick sauce, shadows a large piece of veal on its bed of plump, pebbly faro. Our forks sink through the tender meat with no effort; it easily falls away into pure roasted meat flavor on the tongue. The faro acts as a cushion for the osso buco's boldness, adding a nuttiness that accentuates the roasted, gamey taste. The marrow absorbs all of the jus and saucy splendor of the dish while still maintaining its rich, creamy, fatty integrity, and elevating it to new heights of decadence. The smoky, peppery Allani Campani intensifies the heartiness of the Osso Buco in exquisite complement. The next dish arrives without announcement, delivered to our table by Piero with a smirk, saying “I won't tell you what this is until after you've tasted it.” A leg and thigh cut of meat resembling chicken, and smothered in an aromatic gravy, cuddles up next to a large pool of buttery polenta, crowned by a sprinkling of nut brown porcini mushrooms. The meat( tender, juicy, with the lightness of chicken, but the depth of flavor of a duck) turns out to be Rabbit and, in the words of my dining companion, “It is the most delicious meat I've ever eaten!” The polenta and mushrooms are sublime pairings: the creamy sweetness of the polenta, cooked to an impossibly silken texture, and the woody mushrooms balance simplicity of flavor with richness to round out the flavor profile of the dish and never outshine the rabbit. It is a delightful surprise and a delicious education in Italian regional cuisine. Up to this point, our meal has been an homage to Italy and its many different culinary facets. However, with dessert, I am transported to France, and my own potent gastronomic memories of Paris. The Tiramisu square of layered confection still maintains a distinctive Italian influence, however, the prominence of the Chocolate Crepe transports my taste buds to Parisian sidewalk crepe stalls. The hazelnut and chocolate comfort of melting nutella oozes from the crepe and fills my mind and my palate with nostalgic longing. Similarly the White Chocolate Raspberry Crème Brulee, with its berry tartness, caramelized crust, and sweet creaminess, sends me on a sense memory time travel to past visits of Parisian patisseries, and the extravagant indulgence of a midday crème brulee in the City of Love. These two desserts showcase the talents of Chef Mimmo and his skilled staff, who not only have clearly mastered the intricacies of their own native dishes, but have managed to translate French cuisine into Italian. We end with another quintessential Italian practice: a glass of Limoncello to ease the discomfort of our bloated bellies. The sweet, slightly tart, almost candy-like liquid returns our palates to a pristine state, and gives us a moment of pause and reflection before departure. Our taste buds have been on a whirlwind tour of Italy, schooled in the diversity of its culinary traditions and the richness of its flavors and quality ingredients. And yet, as we say our goodbyes, and are warmly kissed on both cheeks by our waiter and the Ferraro's themselves, we are left with the inviting warmth of home. Corkage Fee: No personal wines allowed. How far is Ferraro's from the Bellagio Hotel and Casino? 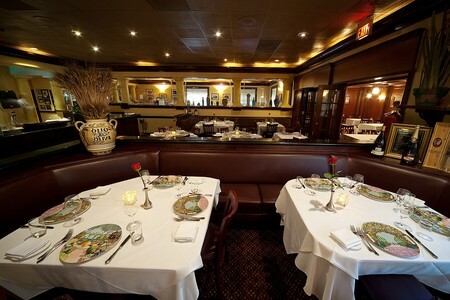 Ferraro's Restaurant and Wine Bar is just under 2 miles from Bellagio Hotel and Casino. It's about a 5 minute drive. Does Ferraro’s have specific menus for private events? 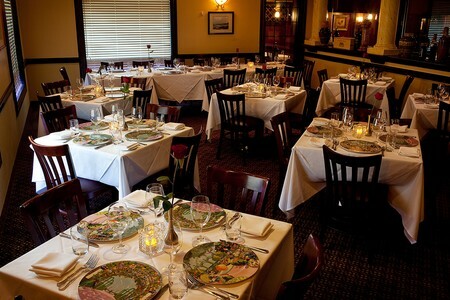 Yes, Ferraro’s offers 3 Event Menus to choose from. Does Ferraro’s require dining reservations? 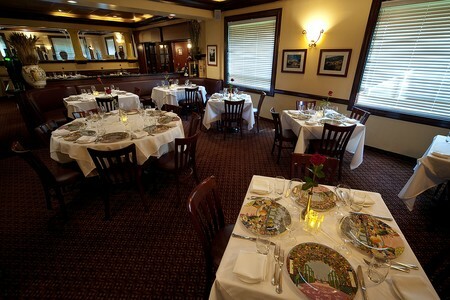 Reservations are not required, but due to the popularity of Ferraro’s they are highly recommended. Yes, Ferraro's pastas are homemade. I strongly believe Ferraro's has the best Osso Buco not only in Vegas, but the best I've ever had anywhere. The Italian food has to be in the top 5. They know what they are doing!! Excellent food, very large wine selection and attentive staff. We had dinner there on a Sunday and were so impressed that we went back on Thursday and brought some friends to enjoy it as well. We will be back when we return to Las Vegas. We would not recommend this restaurant. The food was very average and definitely over-priced! Portions were at best sufficient. Service was not pleasant or impressive. We did not feel comfortable dining here. However, the most outstanding feature was the "arroganct" attitude of the management, notably some guy named "Gino" who apparently is one of the owners.